The awesome Lowepro ProTactic 450AW could be THE backpack! Review was updated ultimo october 2016. I like the bag so much that I purchased a second one. This time a special edt. in digital camo. Back in the “old” days backpacks were uncomfortable and you had to take them off to get to your gear. Those days are over with the Lowepro ProTactic 450AW. Since I work with the Sony a7S and R plus the a6000, I can actually fit 3 cameras in the backpack. That’s really nice. I took it out a couple of times last week to test it, and Saturday it was wedding time. I had a shoot in the center of Copenhagen and I decided to use the bag there. No regrets regarding that decision. The bag is really versatile. In the old days there was one opening and that was in the front. The Lowepro ProTactic 450AW has 4 openings. 1 in the top, one on either side and finally the back. The flexibility is great and adapt to your shooting style and the way you pack your bag. Newly designed separators with velcro. Don’t stick like the old ones. It’s nice and comfortable to wear. Even at 25 degrees celsius my back did’nt get to hot, due to the ActivZone harness, which provides ventilation and targeted comfort for support when walking around. It sits nicely on my back and feels nice and weight distributed. I can definitely recommend it! It’s great for photographers doing a lot of walking. Like me at weddings, when walking around with bride and groom. Below are some more pictures of the Lowepro ProTactic 450AW backpack. Lowepro Pro Tactic SH 200 AW. 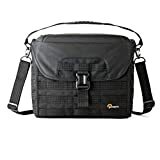 Compact Shoulder Camera Bag Pro DSLR Cameras and Laptop.